Following reports that Google is building its own Android Wear devices, new renders show off the possible look of the two watches. One looks very much like an LG Urbane, while the other is quite sleek, elegant, and compact. The image also shows off an extremely customizable default watchface that might be a part of Android Wear 2.0. The Swordfish is the device on the right and will possibly come in at a cheaper price point. It forgoes cellular connectivity and even a heart rate sensor. 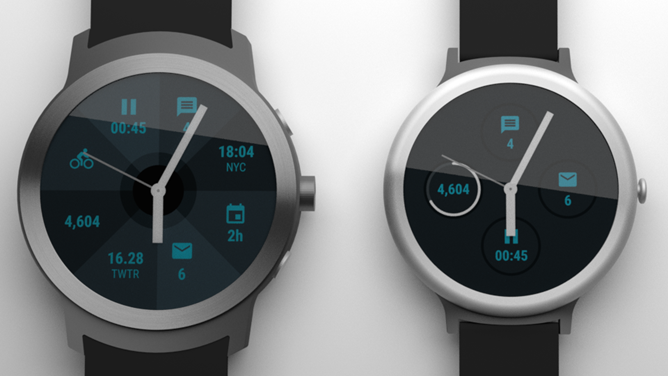 The smaller device has a curved bezel and watch lugs that will support Android Wear’s MODE wrist bands. Like the majority of today’s watches, a single button is placed on the right side. While compact, it manages to forgo the dreaded Motorola flat-tire design with a gap between the display and and the watch’s body. Angelfish is on the left and it comes with several hardware features to fully support Android Wear 2.0. LTE and GPS will allow the watch to operate as a standalone device that does not require a phone. The significantly thicker watch will also feature a heart rate sensor and three hardware buttons in total. Angelfish looks like the first LG Watch Urbane, but with the heft, radio, and additional buttons of the Urbane 2. Despite the largeness, this device will not have support for MODE watch bands, but will presumably still work with regular straps. Android Wear 2.0 is expected in the fall with a big focus on fitness, messaging, and customization, as shown by the new watchface. Complications in the render include activity tracking, step count, stock prices, unread emails, calendar appointments, time, and message count. It appears that this default watchface might be able to tap into Google Now as evident by the face’s apparent ability to list how far a person is from a location, like home.